I was born November 6, 1959 in Syracuse, New York. On August 25, 1984 I married my lovely wife, Terri, and we have two grown sons, Richard and Anthony. I have a degree in Marketing from Niagara University, and work as a self-employed building contractor. I am a 2nd degree black belt in taekwondo and was the 1994 NYS adult middleweight sparring & forms champion. I am the former publisher of Antler Magazine, a magazine dedicated to New York State whitetail deer hunting. In 1997, I produced and hosted a New York deer hunting special called Antler Outdoors that aired to nearly 5 million households across the country. I am currently a, Madison County, measurer and Vice President of the New York State Big Buck Club and the Emcee for its annual awards banquet held in Central New York. 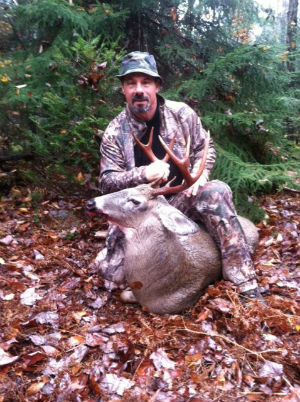 As you may have already guessed, I love New York State whitetail deer hunting. Bow, Shotgun, rifle, muzzleloader, I'd even deer hunt with a hammer if they would let me. Now that I'm in my 50's, I look at deer hunting a bit differently than I did when I first started deer hunting at 16. I have gotten more traditional in my way of hunting over the last 15-20 years. I traded in my compound bow for a recurve and longbow with wooden arrows. I don't shoot a new in-line muzzleloader. I like my old "Hawken" side hammer or flintlock. My rifle inventory consists of a single shot 30-06 and a Winchester, lever action,30-30. My shotgun of choice is an old Remington 870 Wingmaster that my Dad bought me back in the 70's. As a younger hunter I was always seeking the latest and greatest hunting gadgets on the market. Now, that kinda stuff is cool and all, but it just doesn't "blow my skirt up" anymore. I like to keep it simple. Well, except when it comes to the actual hunt itself. I'm not much for sitting in a treestand and waiting for a deer to wander by. I believe you have to go to the deer to consistently catch up with the big bucks. My favorite way to hunt is to track. It is the only way to be on a big buck almost every time you are out hunting. Now, that doesn't mean I always catch up with the buck I'm tracking, but I always know that its a big buck. Knowing you are on a big buck track is like seeing a big buck 300 yards out in your stand. The excitement of knowing he is there and hoping that he makes a mistake that gives you a chance of taking him. Well, instead of waiting days, weeks, and even whole seasons for that buck to come to me... I go after him. As you also may have guessed by now, I am a big buck hunter. I personally love the challenge of a more mature buck. I have been fortunate to have taken eleven bucks that score between 100 and 155 B&C in the last 15 years. Yes, I've had years where I passed up many small bucks only to end the season with no buck at all. That's okay by me. I'm in it for the excitement of the hunt and frankly, the little guys just don't do it for me. Plus I'm hoping that handsome 6-pointer makes it through the seasons to become the big buck that I'll be hunting in the future. It is just a personal choice that I hunt the way I do. Its what makes deer hunting fun for me. Likewise, you should do what makes hunting fun for you. Why New York Antler Outdoors? I have always enjoyed hearing guys tell their deer hunting stories at deer camp. I enjoy hearing other hunters opinions, gathering their knowledge, and sharing ideas. New York Antler Outdoors has all that. I also wanted to offer hunters a place to come and see some of the exceptional bucks being taken each year here in New York. A place to come and enjoy hunting season all year round, read stories, view pictures and maybe learn a little from other hunters. But, most of all... to have fun with the site and enjoy it.